The market has been flooded this year with fully wire-free earbuds, but that form factor isn't for everyone. 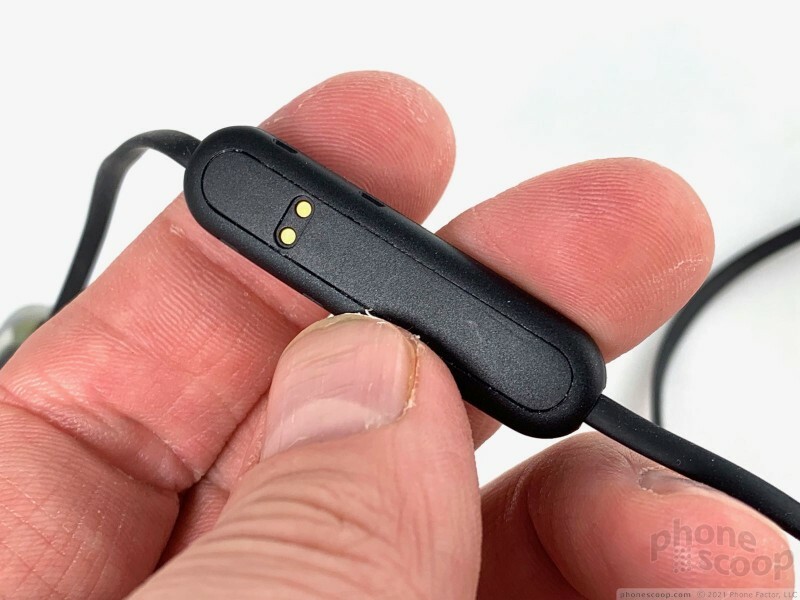 Before truly wireless earbuds arrived, many of the Bluetooth buds we tested were connected by a short cable that you draped behind your neck. There are benefits to this style. For example, you can pull one bud out and let it hang on your shoulder when you need to place your coffee order or help someone with directions. Moreover, you can't lose just one of the buds, thanks to the tether holding them together. 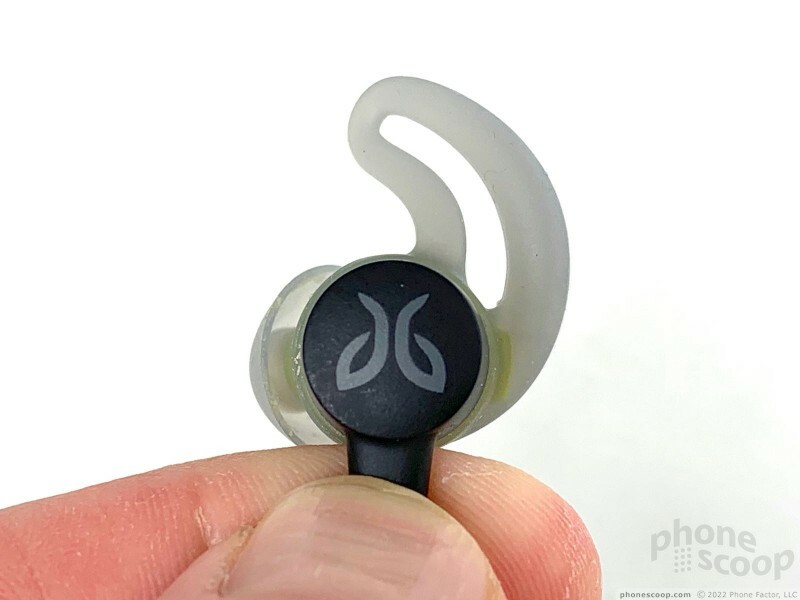 Jaybird is known for making high-end sport headphones, but the Tarah are the company's entry-level offering. Here are our thoughts. The Tarah are a simple, yet elegant set of headphones that have the right blend of function and form. 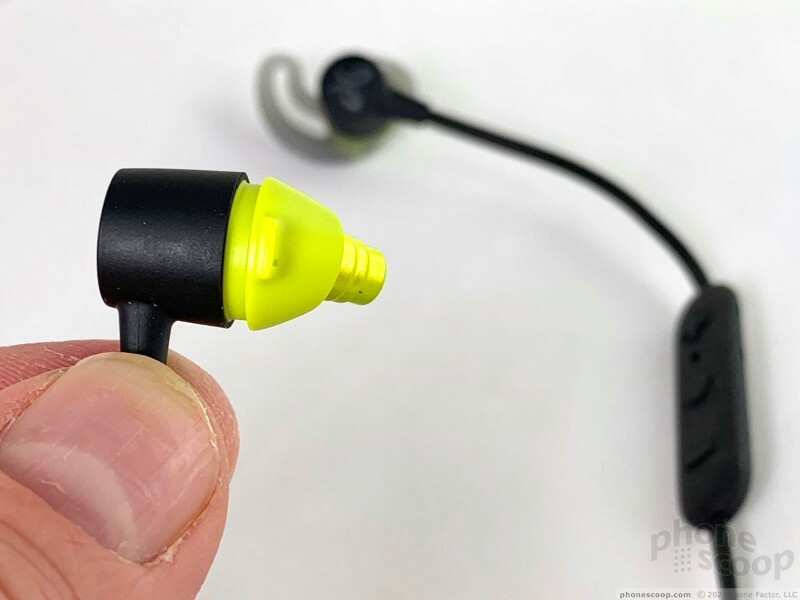 The individual earbuds are fairly large. 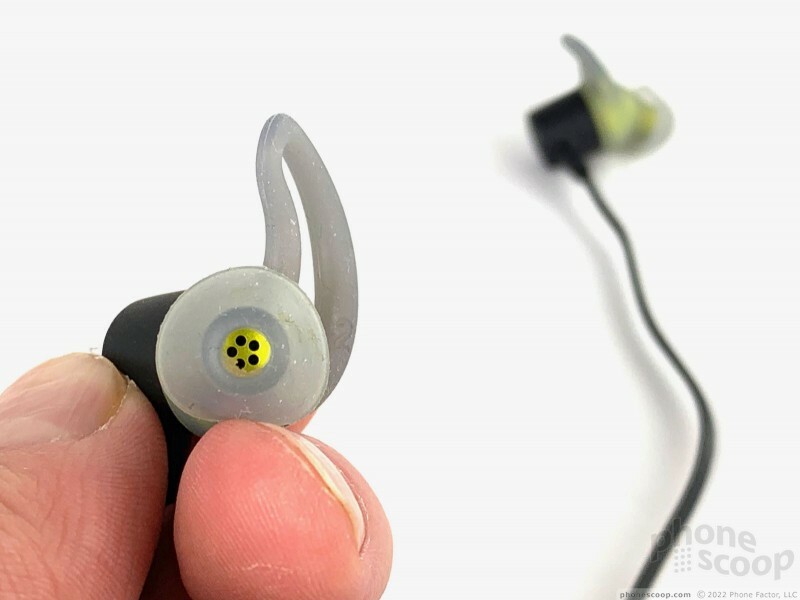 They're the bullet-shaped, in-ear type, and provide passive sound isolation when fitted properly. 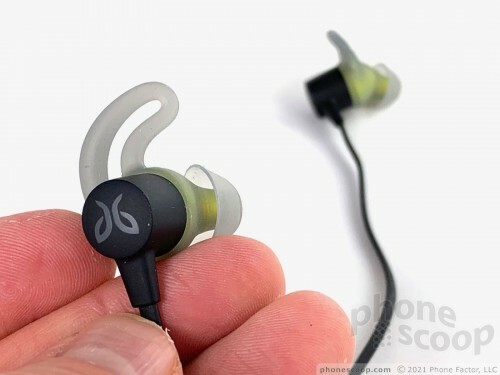 I really like what Jaybird has done with the eartips and ear wings: they're a single unit. The Tarah include three sizes of these (small, medium, large) and they're easy to remove and replace. 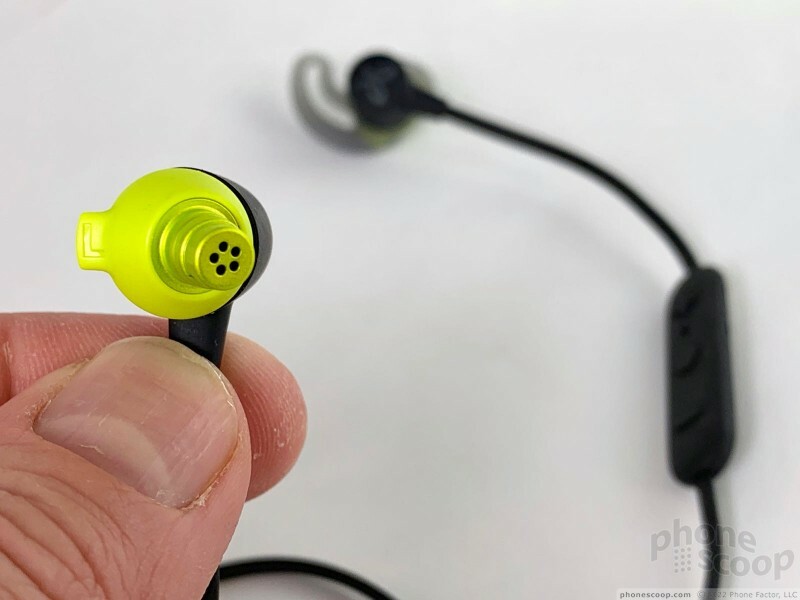 Many headphones include three ear tip sizes, plus three separate ear wing sizes. Combining them means far less fussing with individual bits of silicone. However, not being able to mix and match could be an issue if you have, say, large ears but small ear canals. There are no controls on the buds. 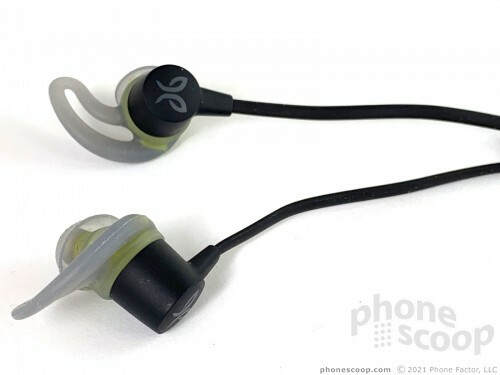 Jaybird opted for a flat rubber cord to join the two earbuds. This is vital for this style, as it helps prevent tangling. A plastic cinching tool is centered along the cord. You can tighten or loosen this as needed for a better fit. 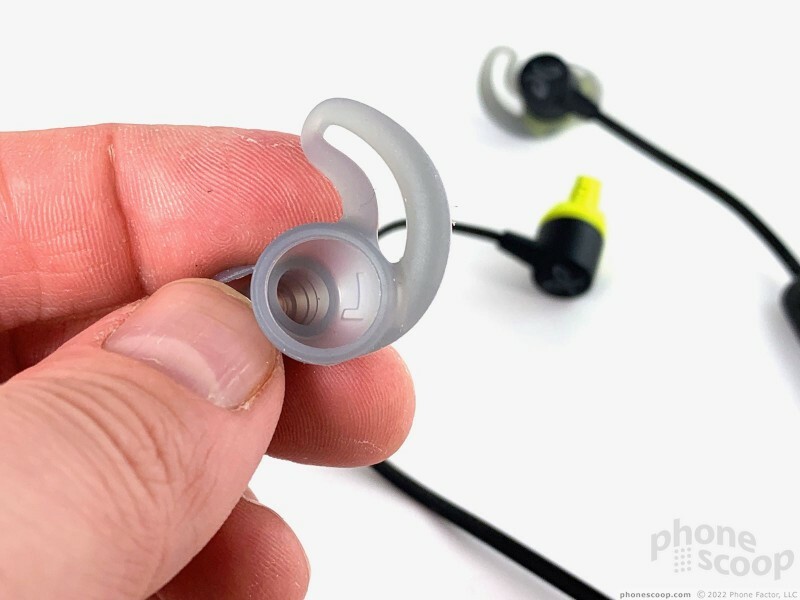 The controls and battery are contained in a plastic pod close to your right ear. 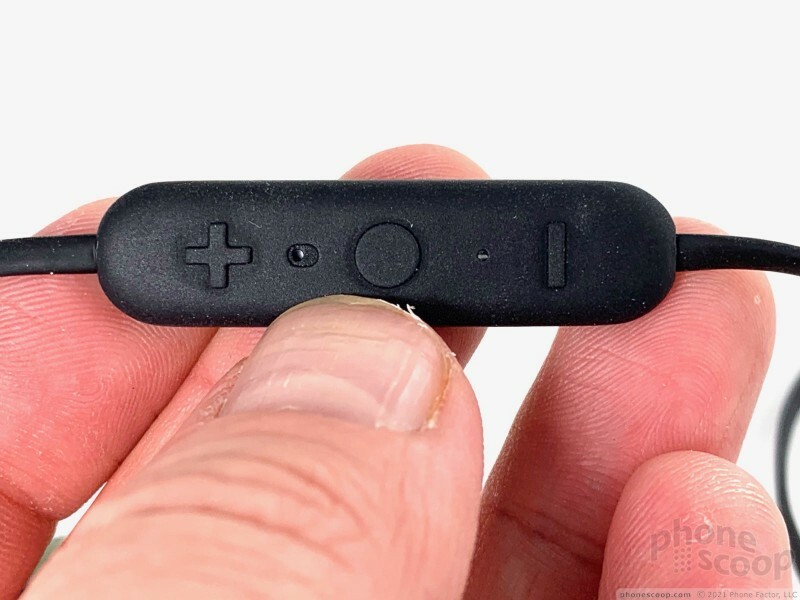 Your thumb will find three raised buttons on the pod: a minus sign, a round key, and a plus symbol. These do pretty much what you'd expect. The round key is for powering them on/off, pairing, playing/pausing music, accepting/rejecting calls, and accessing the voice assistant. Yeah, that's a lot for a single button. It takes some time to learn the necessary patterns. The same goes for the minus key and plus symbol, which let you lower the volume / skip back a track and raise the volume / jump forward a track, respectively. 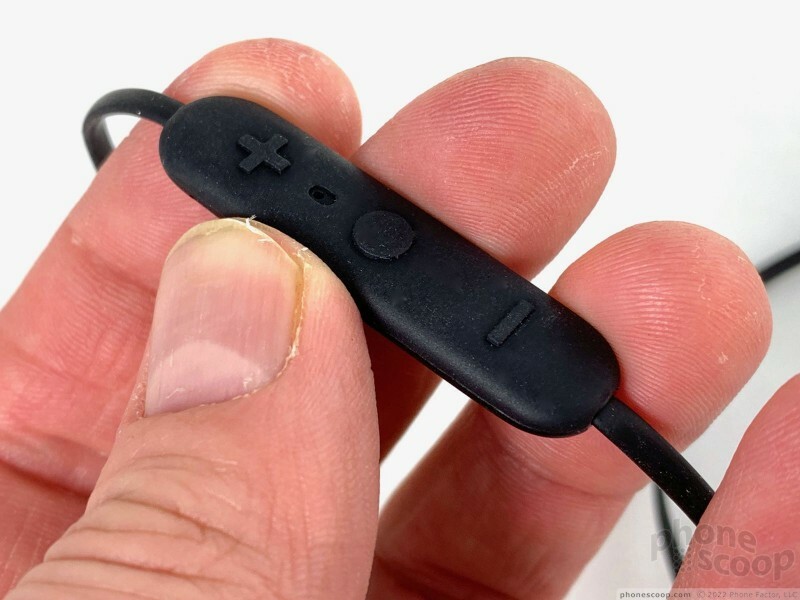 The buttons are covered in a tacky rubber that helps your finger remain planted on the proper button even when sweating. Travel and feedback is very good. 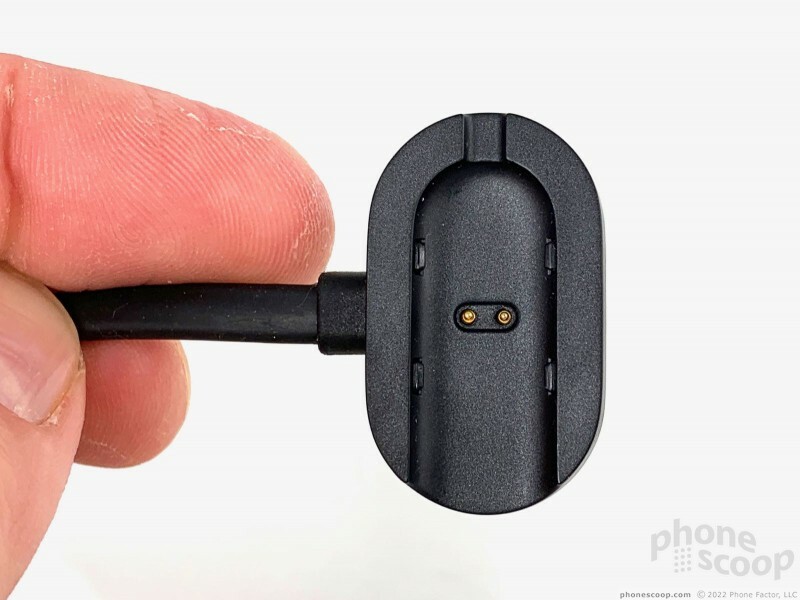 Rather rely on a trusty microUSB port for charging, Jaybird went with conductive pins on the back of the control module. You'll need to use the included charging cradle to power these babies up. 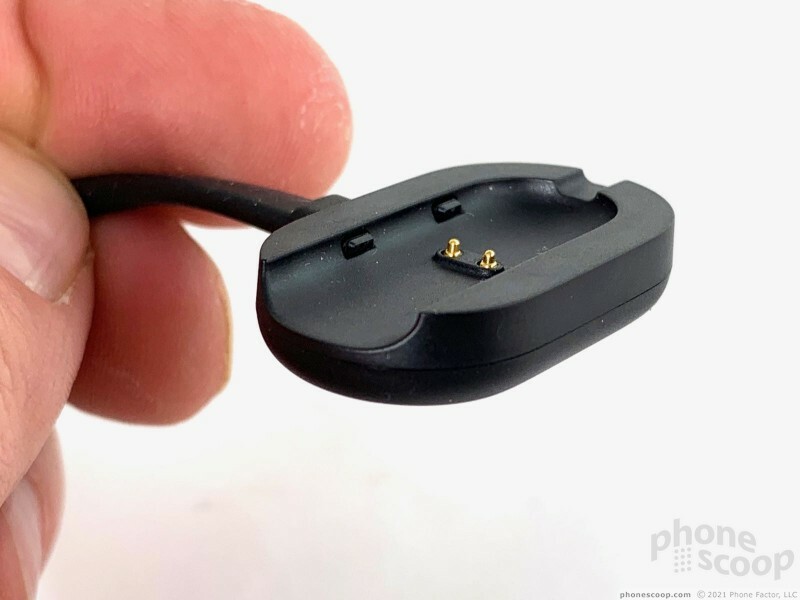 I get that the contacts let Jaybird reduce the size, and help with sweat resistance, but the charging cradle is just one more thing to lose. The Tarah come in three color combos: gray/green, black/yellow, and light blue/dark blue. I'm a little disappointed there's no carrying bag or case included in the box. I tested the Tarah over the course of a week and always found them comfortable to wear for hours at a time with no ear fatigue. They are rated IPX7 and can handle your most intense workouts or a jog in the rain. The JayBird MySound app is over-the-top ridiculous. It has improved and grown a lot since I last tested it. First, the app (available to Android and iOS devices) allows you to customize the EQ curve. There are a number of presets (vocals, jazz, pop, rock, etc.) I was able to find a sound I liked almost immediately. The app also includes a three-band equalizer (low, mid, high) that you can adjust on your own. This adjustable EQ is still a bit awkward to control, but you can hear the effect in the Tarah right away as you tweak it. Better yet, you can sync the EQ settings to the headphones themselves. Your EQ will then be available even if you connect the Tarah to a different device without the Jaybird app. Next up, you can tap into Jaybird's platform for all sorts of bonus stuff, the most primary being music. You do have to create a profile with Jaybird (cough, give them your email address, cough). With a profile, you gain access to dozens of Jaybird-curated playlists. Nearly all the playlists are focused on running, meaning each provides a set of songs with a similar cadence so runners can hold their pace. That's pretty cool. 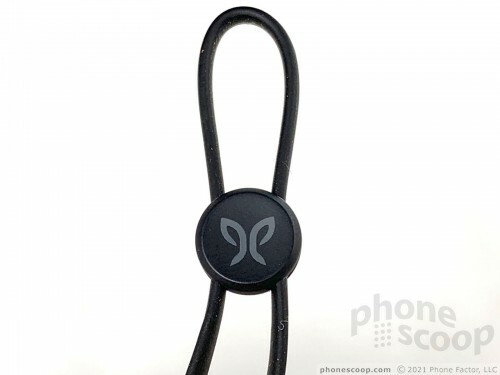 Your Jaybird Profile is a cinch to set up. You can sign in with your Google, Facebook, or Spotify account if you want. Doing so allows you to view and access more playlists, as well as share your own. There are no sports features. You won't find advanced stuff such as a step counter or heart rate monitor built it. Nor does the app offer any sort of step counting or coaching. 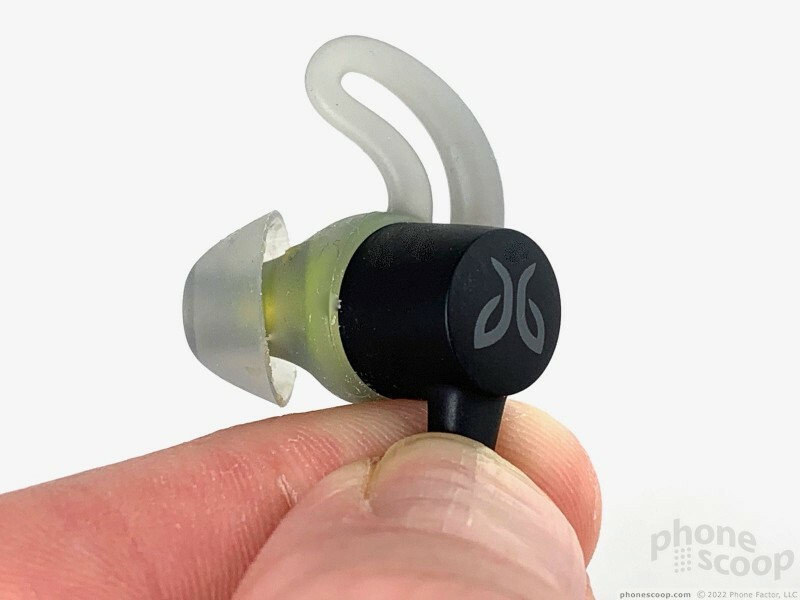 Jaybird went with Bluetooth 5.0 and the standard 10 meter / 33 foot range. Pairing with Android/iOS devices presented no difficulties. 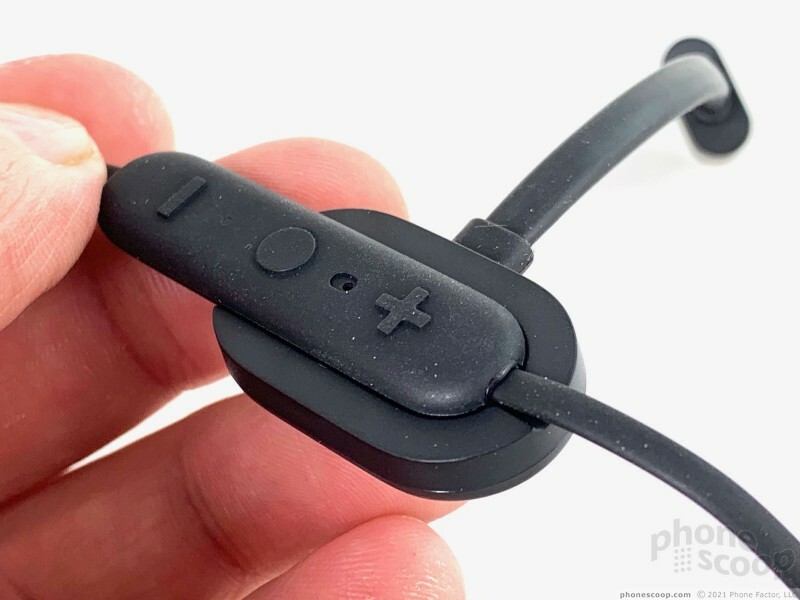 A long press of the power button puts the earbuds in pairing mode and you can easily use your phone's Bluetooth menu to make the connection. The connection is really strong within the defined range. On other devices, it's not uncommon to get playback blips when you shove your phone into a pocket, or wander a bit. I didn't experience any of that with the Tarah. I found they dropped the connection closer to 35 feet than 33, though they'll start to get sketchy around 30 feet. 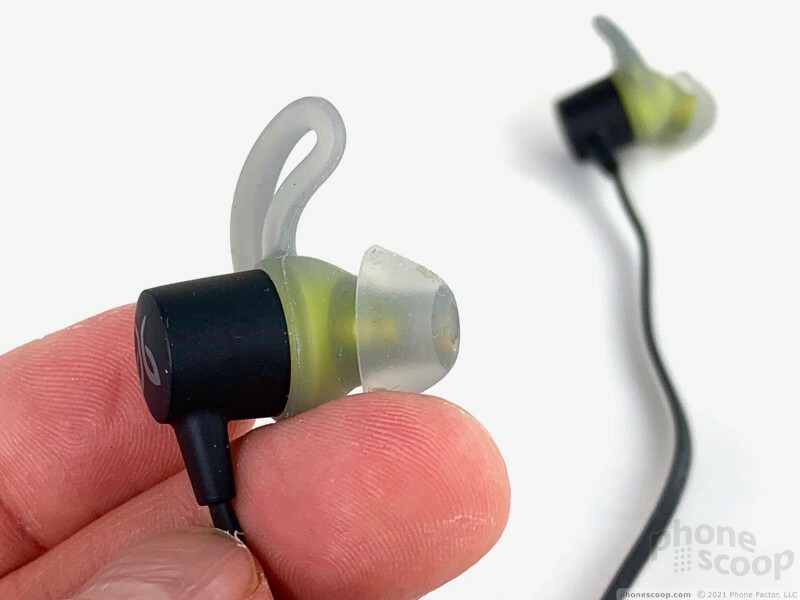 Each earbud has a 6mm driver with a frequency response of 20 Hz to 20 kHz. That's fairly typical for this form factor. They support 16-bit stereo and rely on the standard A2DP protocol. The last set of Jarbirds I reviewed surprised me in their quality. The Tarah surprised me, too. The Tarah deliver clear music that is full and well-balanced. I was pleased with the sound using the stock, flat EQ before I installed the Jaybird app. Using the app to find your ideal sound profile pushes the Tarah from great to outstanding. Your experience will depend a bit on the fit you achieve using the eargels. With a tight seal, the Tarah isolate your inner ear from nearby sounds and create a confined space for the bass to resonate. If the earbuds come loose, you'll know right away because the bass will drop. These are seriously good headphones. 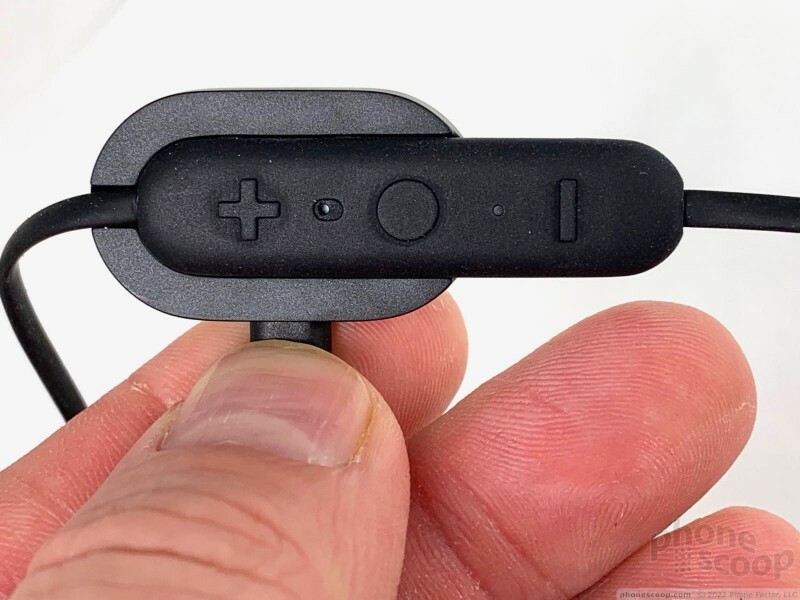 There is a microphone integrated into the control pod for phone calls. I found that the people I spoke to through the Tarah sounded excellent to me, but I sounded far away to them. Battery life is the last piece of the puzzle. Typical to this form factor, battery life isn't the best. The embedded battery delivers up to six hours of playing time. I generally got closer to 5.5 hours. That's long enough for a good workout, or a commute to/from work, or even a short trip. The good news is that if you drop the Tarah into the charging cradle for just 10 minutes, it'll give you another hour of music playback. Unfortunately, it takes more than two hours to recharge the Tarah completely. 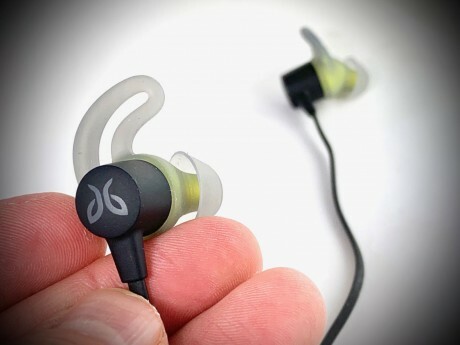 Jaybird sells the Tarah for $99. If you're looking for a really good pair of sport-style earbuds, these should be at the top of your list. The only true drawback as far as I am concerned is battery life. I'd prefer these got closer to 8 hours, but ~6 hours isn't terrible. 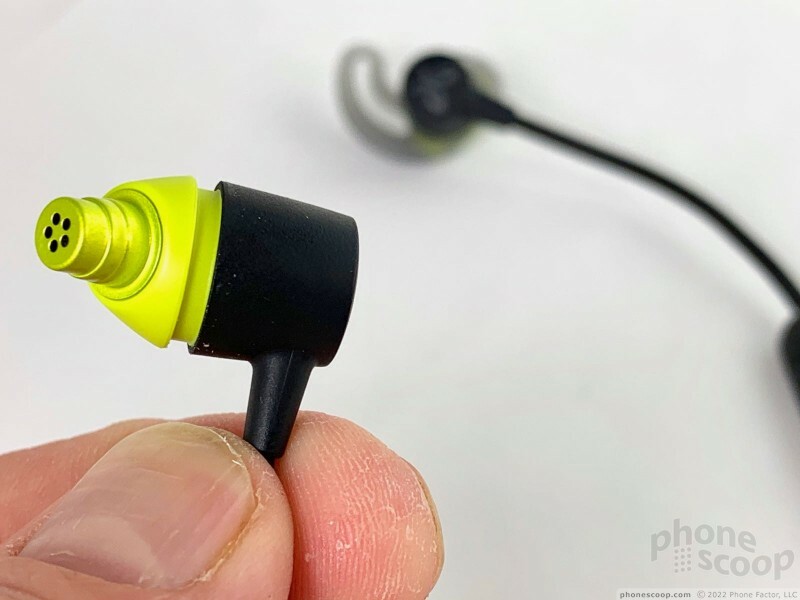 More importantly, they're simple to use and deliver a great music listening experience whether your trying to forget the world or charge vigorously through it. 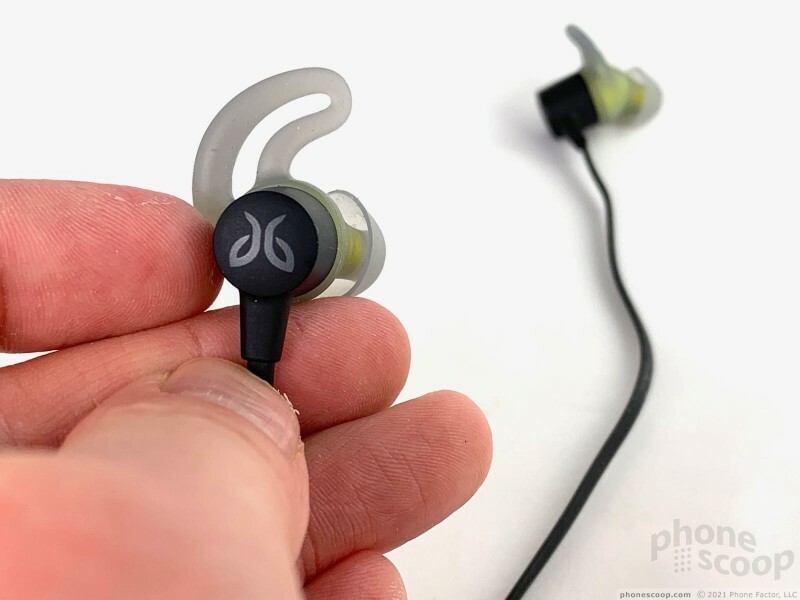 Jaybird's Freedom headphones demonstrate that it is possible to have good sound, comfortable fit, and plenty of style in a set of Bluetooth buds. 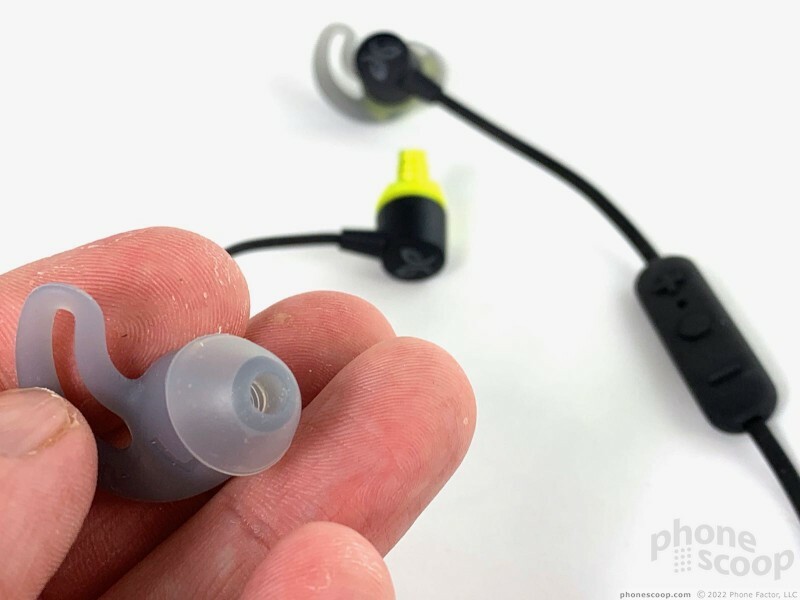 These wireless earbuds are more expensive than competing models, but in this case you get more than what you pay for.